Kevin Anderson will square off against sixth seed Tomas Berdych for the 11th time in the past 28 months on Wednesday at the Mutua Madrid Open. 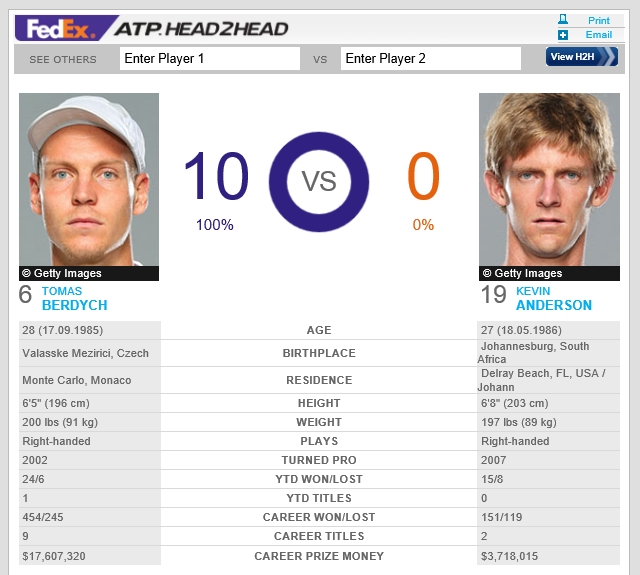 Anderson, who has yet to beat Berdych, recorded his 16th match win of the season on Tuesday when he defeated Radek Stepanek 3-6, 6-3, 6-4 in one hour and 55 minutes. Tomas Berdych moved to an 11-0 FedEx ATP Head2Head mark over Kevin Anderson as he defeated the South African 6-1, 6-4 Wednesday to reach the third round of the Mutua Madrid Open. All of the pair’s meetings have come in the past 28 months. The sixth-seeded Berdych, runner-up at this ATP World Tour Masters 1000 clay-court tournament two years ago (l. to Federer), opened his campaign with victory in 70 minutes, winning 80 per cent of his service points and converting three of his 10 break points. "It was a good match. I was very happy, especially with the conditions,” said Berdych, who is coming off a runner-up showing at last week’s Portugal Open in Oeiras (l. to Berlocq). “I always like to play here. The courts are great, very well prepared. It's a bit faster because of the altitude, which suits my game well and means I can serve well and play aggressively. Berdych goes on to face 12th seed Grigor Dimitrov, who overcame a first-set deficit to claim a 4-6, 6-3, 7-6(7) win against Romanian wild card Marius Copil. The Bulgarian, who claimed his first clay-court title two weeks ago in Bucharest (d. Rosol), won 80 per cent of first serve points during the contest lasting two hours and 10 minutes. Ester Satorova watches boyfriend Tomas Berdych during his straight sets victory against Kevin Anderson of South Africa in their second round match during day five of the Mutua Madrid Open tennis tournament at the Caja Magica on May 7, 2014 in Madrid, Spain. Czech Republic model Ester Satorova applauds her boyfriend Tomas Berdych after his straight sets victory against Kevin Anderson of South Africa in their second round match during day five of the Mutua Madrid Open tennis tournament at the Caja Magica on May 7, 2014 in Madrid, Spain.